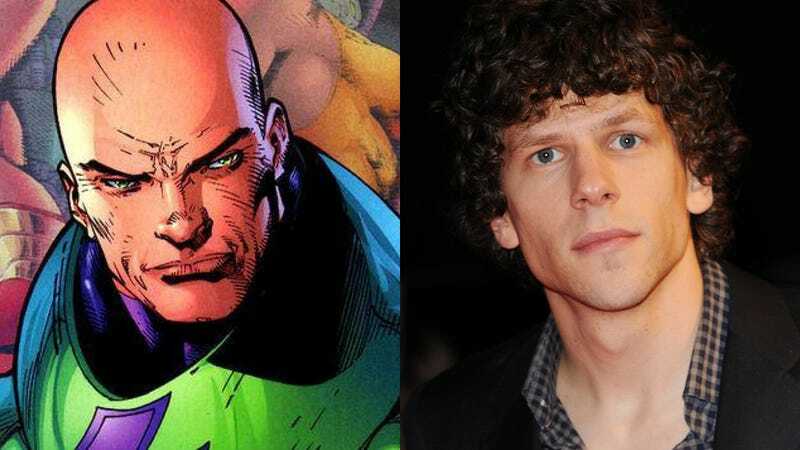 Jesse Eisenberg is going to bring all the creepy affectless hostility he cultivated in the Social Network to the role of Lex Luthor in Batman Vs. Superman, the sequel to last summer's Man of Steel. And you'll never guess who's the new Alfred. Jeremy Irons, star of Dead Ringers and The Lion King, will be the Alfred to Ben Affleck's Bruce Wayne. It sort of makes sense that with a younger Superman and an older Batman, you'd have a younger Lex Luthor and an older Alfred. Lex Luthor is often considered the most notorious of Superman's rivals, his unsavory reputation preceding him since 1940. What's great about Lex is that he exists beyond the confines of the stereotypical nefarious villain. He's a complicated and sophisticated character whose intellect, wealth and prominence position him as one of the few mortals able to challenge the incredible might of Superman. Having Jesse in the role allows us to explore that interesting dynamic, and also take the character in some new and unexpected directions. As everyone knows, Alfred is Bruce Wayne's most trusted friend, ally and mentor, a noble guardian and father figure. He is an absolutely critical element in the intricate infrastructure that allows Bruce Wayne to transform himself into Batman. It is an honor to have such an amazingly seasoned and gifted actor as Jeremy taking on the important role of the man who mentors and guides the guarded and nearly impervious façade that encapsulates Bruce Wayne. We're on the fence about this casting — but I could see Eisenberg being pretty good at bringing Lex Luthor's hatred of Superman to life. Top image of Jesse Eisenberg: Getty Images.